The Hindu Temple of Greater Chicago or the Lemont Temple, as we called it, was a destination on Sundays for more than just Sunday School and prayer. The canteen there was simply amazing. On Sundays, Murli the head chef would regale us with delicious masala dosas and soft and spongy idlis. The sambar was the spiciest I have ever had. Every other Sunday, during the school year, my daughter attended language classes where she learned the Hindi varnamala. As soon as she was done, we made a beeline for the canteen. After pét-puja, we would head upstairs to the inner sanctum of the Lemont Temple to bow our heads to a greater force than man. The Lemont Temple is a landmark in Lemont, a suburb of Chicago. Founded in 1977, you can see the temple perched on a hill from afar. There are two main temples: the Rama Temple and the Ganesh Temple, built by artisans and craftsmen from India. In the recent past, sculptors from India carved an intricate set of the Dashavatar that is displayed in the Rama Temple as well as a new auditorium and community center. The temple has evolved as a rich cultural center and a place of worship. Having left this behind in Chicagoland, I looked forward to finding out more about the Hindu Temples in Boulder County, Colorado. More about that in my post next week because right now I want to share a recipe that my family loves: Un-Stuffed Bhindi. Bhindi is the fruit of a drought-resistant vegetable plant, also known as lady's finger in India. (Ladyfingers means something totally different out here in the US! So never forget the difference between ladyfingers and lady's fingers and always call it okra!) It's my favorite vegetable and it's not easily found in the stores. Most Indian grocery stores will carry it but the pods are pre-packed and I am never totally happy with the quality. So I compromise and buy Bird's Eye Baby Okra from the frozen section of the regular grocery stores. Buying frozen means that stuffed bhindi is not an option. But then stuffed bhindi is time intensive and involves a lot of clean-up. So I take yet another short-cut and make this Un-Stuffed Bhindi or bhindi that has the stuffing on the outside. When they start crackling and spluttering, add the asafoetida, followed by the cumin seeds and turmeric powder. Add the frozen baby okra and move it about so that each okra gets a nice coating of the tempered oil. Add about 1/2 tsp salt to the okra at this point. 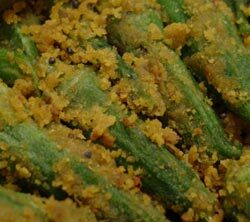 While the okra is cooking, put the besan in a large plate or salad bowl and mix the amchur, cumin powder, coriander powder, red chilli powder and remaining salt into it. Break every blob of flour that you see. Dry roast the besan mixture in the microwave for 2 minutes at 30% power level. Mix the besan mixture around so that any moisture that is trapped is released. Dry roast it in the microwave again for another 2 minutes at 30% power level. The besan should be about ready - you should be able to smell the aroma of the spices mixed into the besan as well as the besan itself. Roughly divide the besan mixture into 4 parts. Sprinkle one part over the okra and mix in a folding type of motion, making sure that the okra does not break. Do the same with the remaining 3 parts of the besan mixture. Continue cooking for another 5 minutes or so so that the besan becomes crunchy around the okra. Do not overcook as the okra will become mushy. The crunchy crumbs are an added delight! I usually serve this with yogurt and rotis that are hot-off-the-tava. Thanks for this recipe manisha. I love bhindi..I used to prepare quite a variety of bhindi dishes, but this one is new for me. I will try this soon. Hi Shilpa! Make sure you use young and tender bhindi for this recipe. I visited your blog and I found your Sambar Kolmbo recipe mouth-watering. My husband returns next week after 4 weeks of being away and since idli is usually the welcome-home dish, I think I am going to try your sambar. I'll let you know what we thought of it! You're so right, Kay! I just love bhindi. But I miss the bhindi you get in India. It is darker in color and I feel it has a lot more flavor. Manisha, thanks for the yummy recipe. I tried this but the besan didn't become crunchy...more on the mushy side. Still tasted great but not as good as it could I'm sure...any tips? Did you roast the besan well? Lowering the heat also helps after adding it to the pan also helps. The other thing you could do is cook the okra completely, ensure that is no extra moisture and then add the besan mixture. I hope this works for you. I will give it another try and let you know. Thanks! Still made for a great side with dahi chawal. 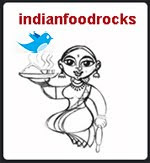 Sorry Manisha, one more thing - do you think it matters if you use frozen vs fresh okra? nithyadas, if you can get fresh tender young bhindi, that that is ideal. However, you need to wash it well and wipe every pod dry. If you skip this step then it gets slimey. I use frozen baby okra because I am lazy :-D and also because I haven't been able to find fresh baby okra. When I have been able to lay my hands on fresh okra, it's usually not all that tender and I prefer to make the regular chopped bhendi chi bhaji with diced potatoes. Nice recipe! But why do you say frozen okra rules out stuffing? PS: this word verification even after previewing is crazy, I don't think I would bother to post any more comments on blogger!